Here's the Canadian deployment: 6pdrs with 1st platoon to the South, 2nd Platoon in the middle covering B objective, a screening force of Engies out front, with 3rd, the Achilles, and artillery covering the North. the UCs were spread to give clear views down roads, and hopefully lift gone-to-ground. 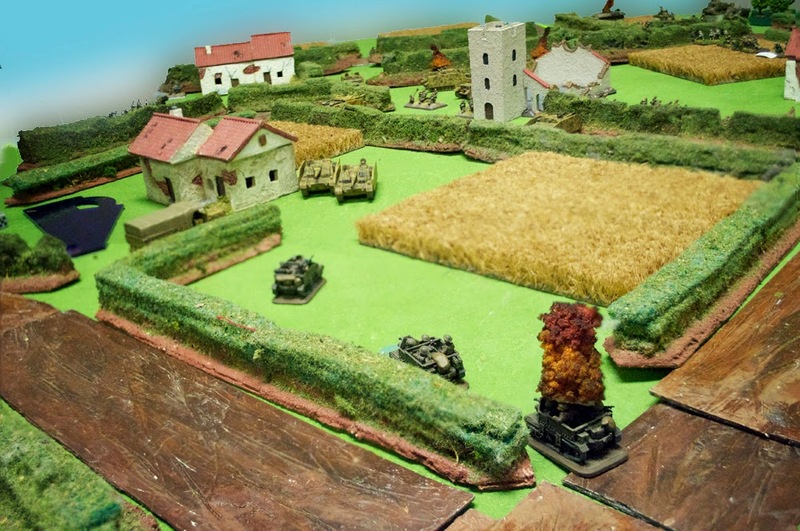 Across from me were the Germans: Thanks to the density of bocage, he was somewhat cramped. The North side had one platoon of StuGs, as well as the rockets. The middle was loaded with a huge number of tanks, some armoured cars, and the infantry, with the South seeing the last StuG platoon facing the bushes across from 1st platoon. As Recon Movement, the 8-rads rounded the corner and rolled along the road, staying carefully out of range of the 6pdrs peeking through the hedges. the entire German force advanced and spread out, with the infantry crossing the wheatfield, StuGs 3rd and 1st advancing fairly straight, and StuGs (2nd) and Co going along the road. The command team of the rockets sighted down the road and dropped their payload on my Achilles, UCs, and part of III platoon. I lost a single Achilles. To the North, StuGs opened fire at the UC patrol, which pulled out of view without casualty. Lots of fury, and one of my few 17pdrs disappears. 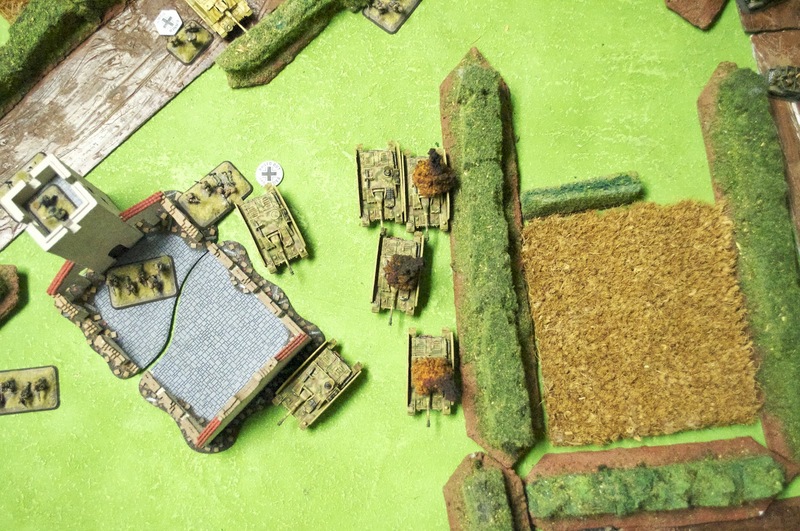 In response, the Shermans appear from ambush in the middle, opening fire at StuG (3rd) platoon, and killing two. 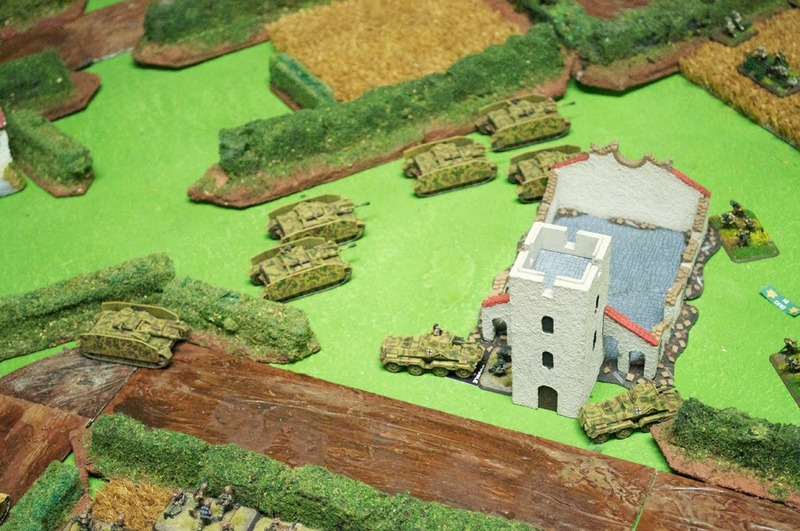 The UCs make a move to go silence the rocket command team, and the remaining Achilles moves to cover the hedgerow between it and the church. My Sextons fail to kill any infantry stands, but do pin them temporarily. Foolishly, I attempted to have my pioneers charge the last StuG from 3rd, but I forget they need to be in concealing terrain to get the sneak attack. 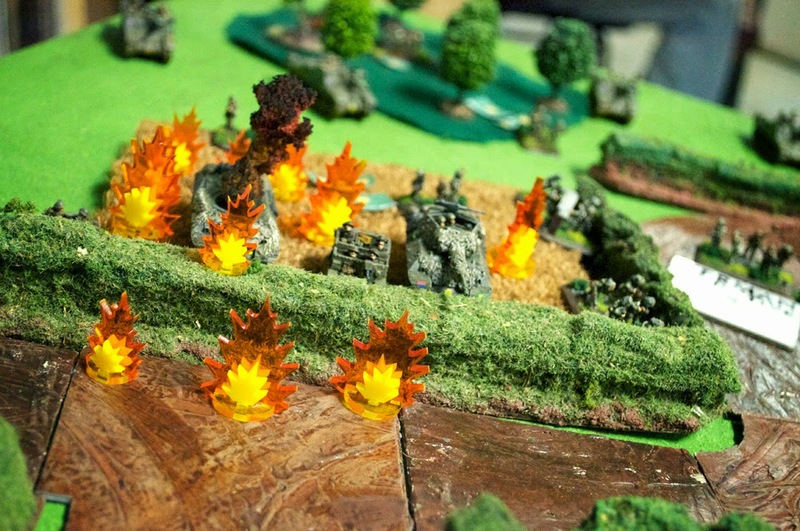 An 8-rad and the hull-mg kills two stands and fends the platoon off. Achilles relocates, and Shermans pop in. 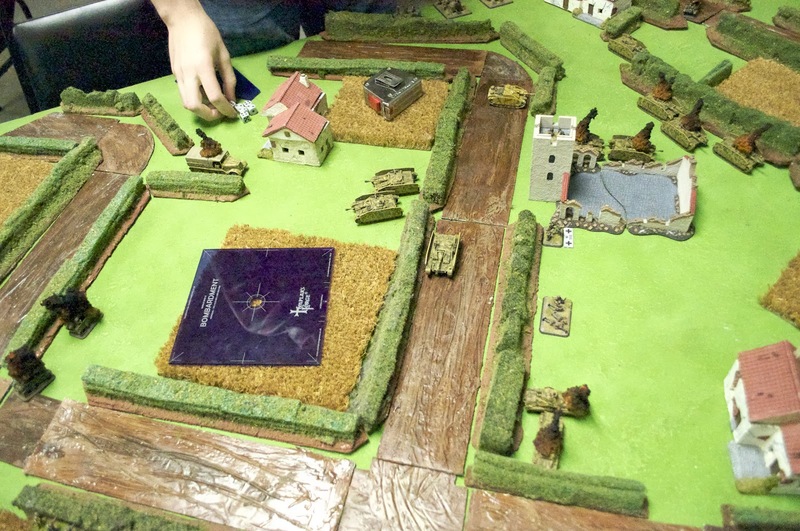 StuGs pile around the church, as the 8-rads face off against the engineers. 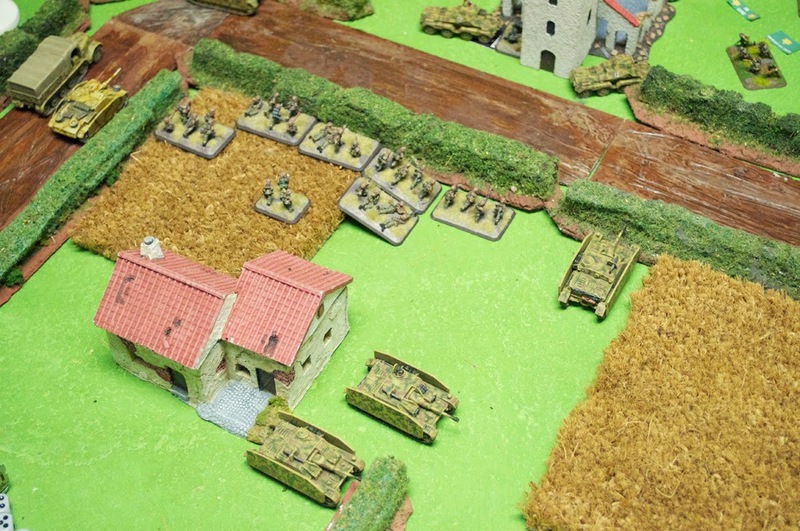 Infantry advances to the bocage, and the last StuG platoon spreads out to cover. 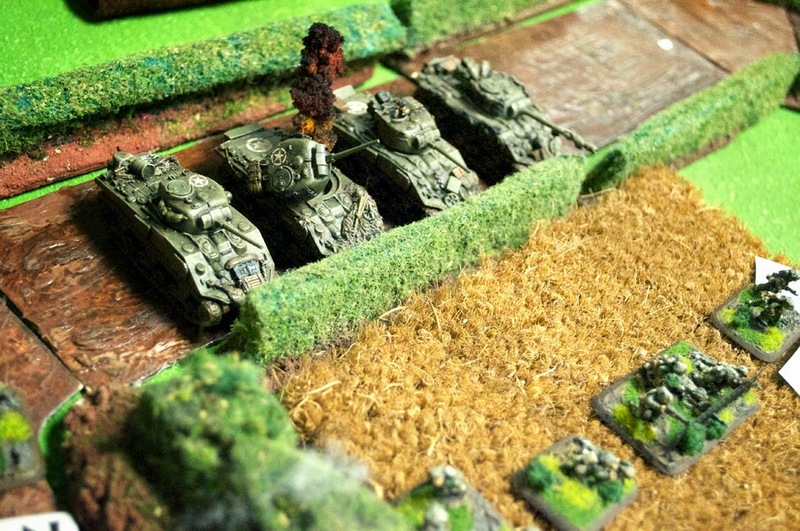 The newly arrived tank platoon lays into the StuGs, brewing up two. I love my Firefly! On the far side, the UCs leave the field to charge along the road in search of rockets. 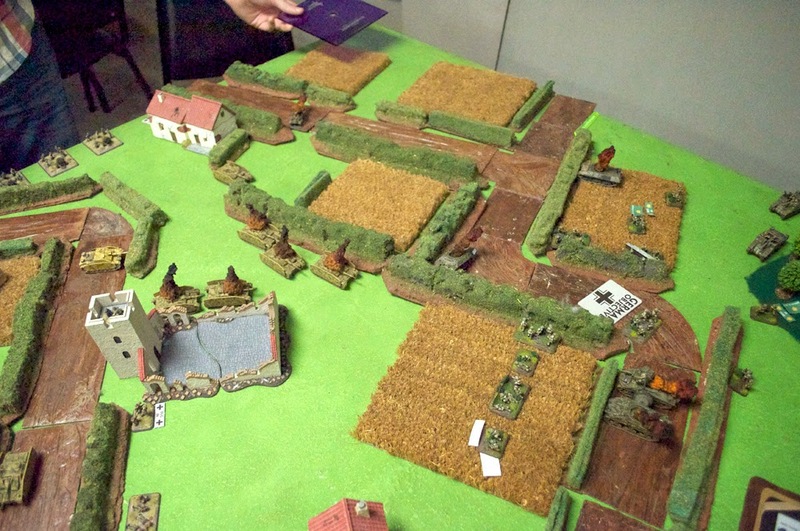 On the 2nd turn, the 8-rads bypass the remaining pioneers and line up on the bocage overlooking the crossroad. 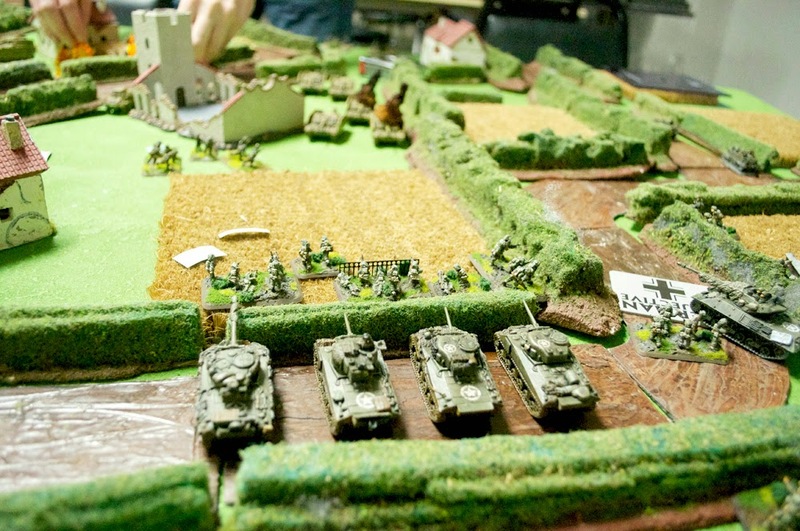 The StuGs all essentially pile forward, either facing off against the pioneers, pushing through bocage, or trying to use wrecks and the church as cover while drawing a bead on the Shermans. Rockets again slam into my lines, this time over by 1st platoon and the 6pdrs, killing an infantry team. 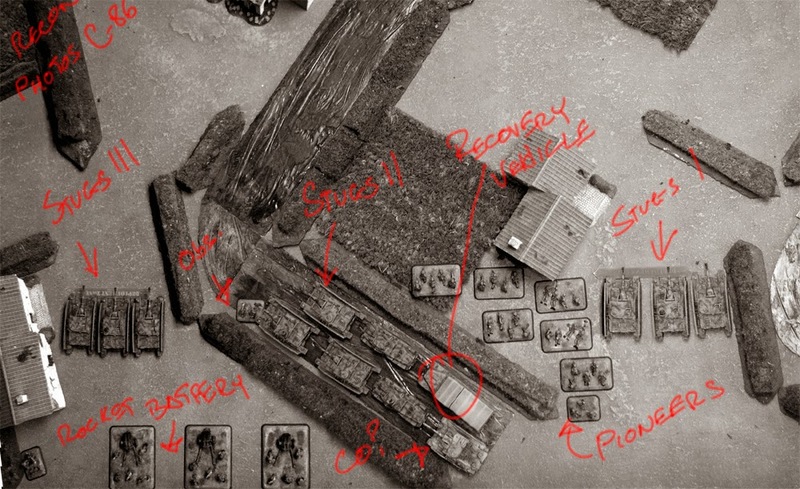 The pioneers suffer fire from the 8-rads and remaining StuG again, and decide that (presumably) hiding in the church is better than staying visible, and quit the field. The Canadian Left suffers rocket fire, but endures. 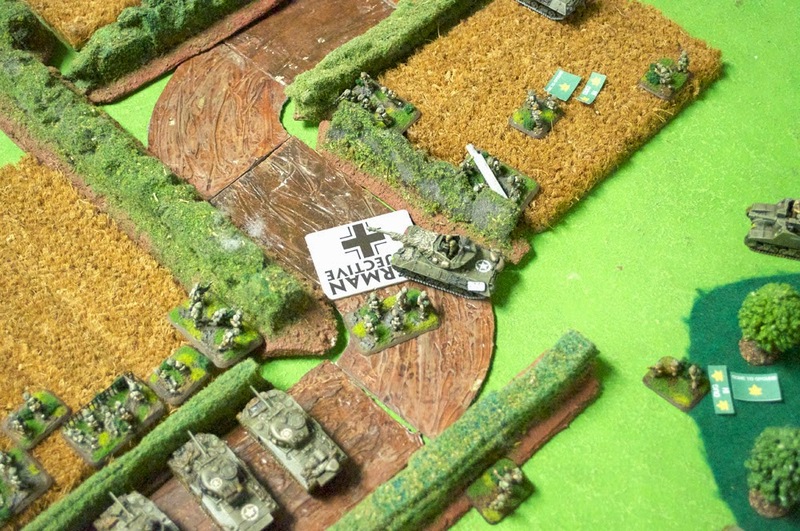 More StuGs suffer at the hands of Shermans, and the centre's getting quite messy! On the German 3rd turn, apparently the StuG CO decided he hated UCs. To the North, the remaining tank of 2nd StuGs round on the UCs that had been harassing infantry (you can kind of see them in the last image), and to the South the brazen UCs that dared tempt the wrath of StuGs found themselves staring down the 7.5mm barrels. Fire from the StuGs knock out one UC at the north, and kill one and bail one at the South. 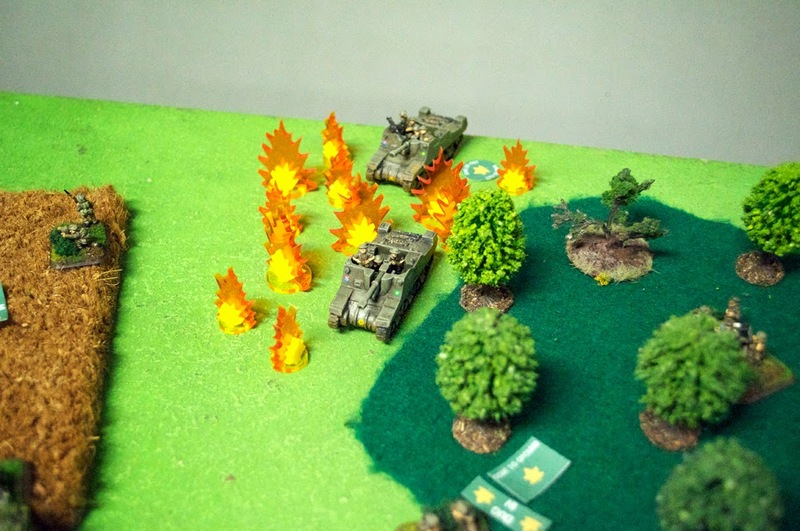 Sadly, the run of luck from the Shermans came to an end as two light up from concentrated fire by StuGs. Rockets, for once, fail to kill anything, despite ranging in. 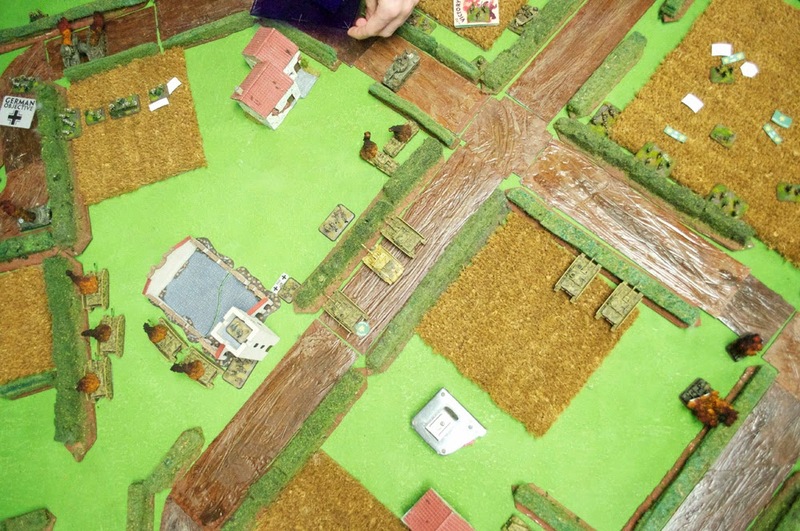 The Pioniers spend this entire turn attempting to get closer to the 8-rads at the crossroads, hoping to jump on an objective. UCs suffer at the hands of the StuGs, while the FAMO lurks, hoping to remain unseen. the StuGs have had enough of the Universal Carrier shenanigans, and threateningly advance on them. Rockets again fall amongst the 6pdrs, and two lucky shots break two of the guns. The StuG CO sights the Achilles, ending its threat. 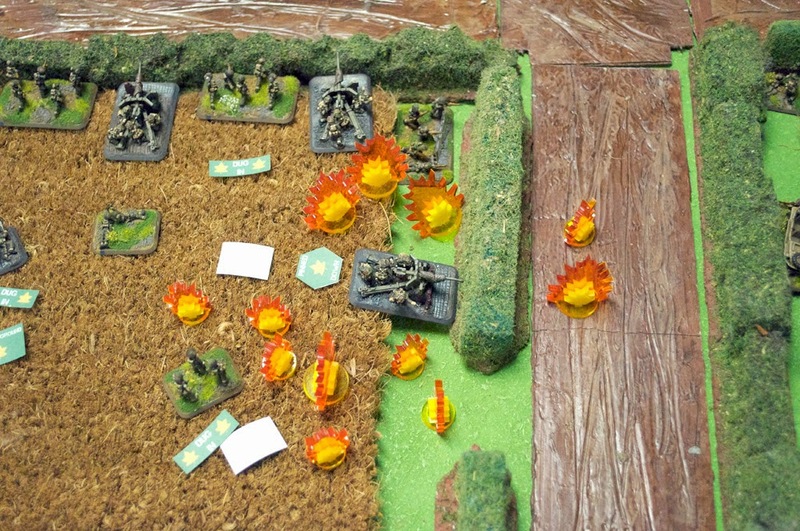 The Pioniers have had enough incoming fire and dig in where they are, 'safely' in the middle of a field. With the 2nd Achilles gone, Sextons and an infantry platoon are all that hold the North objective. This turn my last UC manages to safely extract, carrying the injured crew from the other two, thanks to Stormtrooper moves that pulled his platoon out of the 8-inch threat radius. The remaining 6pdr that can draw a bead lines up and blows up the last 8-rad. Burning FAMO, burning UCs, burning 8-rads, and 5 burning StuGs, and only 2 teams left of the Pioniers! 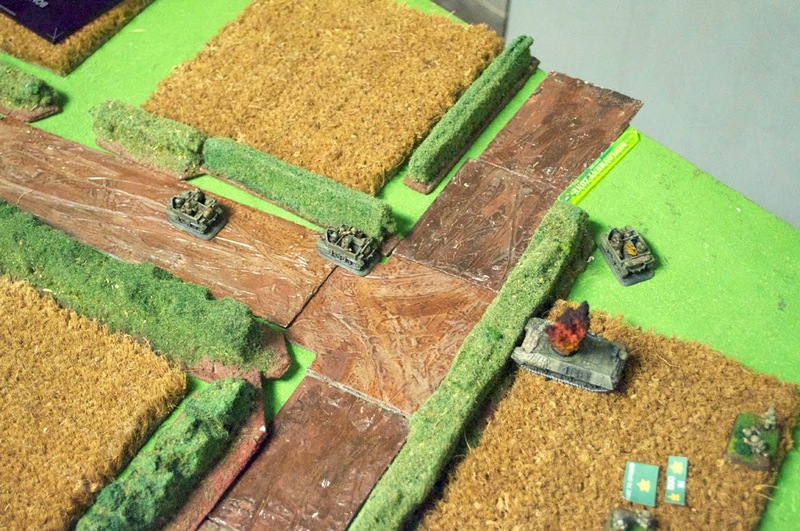 The remaining StuG platoon pushes up through the cornfield, lacking any UC threats, and attempts to threaten the left-most objective, aided by the CO. The Nebs again steadily range in on 1st platoon and the 6pdrs, and kill the remaining gun that can see down the main road. Somehow, the Firefly weathers a storm of fire from the StuG platoon, and comes out unscathed. In the final two turns, the StuG CO manages to brew up the Firefly, and the Sextons suffer the attention of the Nebs, but only one bails. To the south, 1st platoon pulls off, followed closely by objective B and the Sextons, with the last objective and remaining Canadians pulling back having left a field of destroyed vehicles. The game ended a 5-2 for the Allies!